Q From James Cameron in Australia: What is the history and origin of the term the whole ball of wax? I have heard explanations indicating that it is derived from workers at Madame Tussauds, but this seems a bit contrived, not to mention trite. I have also heard that it is derived from the term the whole bailiwick. This sounds more convincing to me, but it may be just as contrived. I would appreciate your learned opinion. A If I had a learned opinion, you would be welcome to it, but mine is almost as much based on ignorance as the next man’s. However, we do know a few facts, and I can add a couple of new ones. What we do know is that the whole ball of wax is everything and so essentially means the same as other American expressions such as the whole nine yards, the whole shooting match, the whole megillah, the whole shebang and the whole enchilada. Until recently, its first appearance was in the ninth edition of Webster’s New Collegiate Dictionary of 1953 and was assumed to be of that period. It turns out to be much older. We can dismiss the Madame Tussaud’s connection out of hand. It’s the product of an unoriginal mind which has linked wax with waxworks and done the equivalent of making two and two equal five. Another story appeared in William and Mary Morris’s book The Morris Dictionary of Word and Phrase Origins. They quote an English legal text from 1620 which describes the allocation of land among the heirs to an estate by a process very much like a lottery. Each parcel of land was listed on its own piece of paper, sealed inside a small ball of wax, and placed in a hat. Each heir then pulled out one of the balls to discover which part was his. The Morrises were strangely credulous about a link between this process and the expression in view of the nearly 400-year and more than 3,000-mile gap between that description and the then first known appearance of the phrase. Whatever the origin, this isn’t it. A graphic artist, a subscriber to my newsletter, reported that he heard in a seminar on typography that the phrase comes from typesetting. He was told that, in the days when type was made of metal, small pieces of gold would flake off the typesetting equipment. The typesetter would collect the gold flakes in a ball of wax to later melt down and reclaim the gold. Very often, someone would make off with the whole ball of wax. I don’t believe that either. So far as I know, no gold is used in typesetting, though the story might be valid for goldsmithing or jewellery manufacture. However, I can’t find a reference anywhere to that method having been used to gather up flakes of waste gold. I did find what seemed to be a clue to its origins, in a disintegrating paperback in my library — a science-fiction novel of 1954 by Shepherd Mead, who two years before had written How To Succeed in Business Without Really Trying. 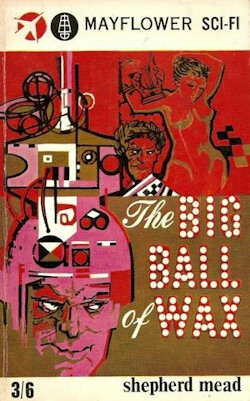 Called The Big Ball of Wax, it’s a futuristic satire on business and advertising in America and contains this line from the narrator, a market research man, about the story to come: “Well, why don’t we go back to the beginning and roll it all up, as the fellows say, into one big ball of wax?”, that is, put everything together to make a coherent and complete whole. This sounds too much like a fuller and less elliptical early version of the saying to be a coincidence. The origin has been taken back so far that it is beginning to look as though another often-told story might be the right one. It is said that whole ball of wax is a humorous modification of whole bailiwick, perhaps because of a mental association between bail and ball, and between wick and candle wax.